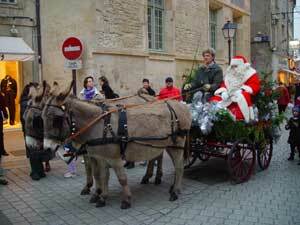 The arrival of Father Christmas in Caen at the request of the Tradesmen's union. To find out more, please visit our website regularly, do not hesitate in contact us for more details on our prices. When the weather is fine, what could be more pleasant than rambling in the foot paths of the countryside with your donkey? advices for all the precautions and safety points which are necessary for excursion. mini-excursion in the afternoon to put the theoretical advices into practice. N.B. 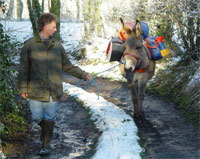 : If you prefer it is possible to come with your donkey, your pack and all your equipment. If you like see, you can take advantage of hikes or harnessed ballad proposed by Pascale. Discovering nature with your cart will bring you an intense satisfaction; this leisure is more and more practised by the equidaes's owners. 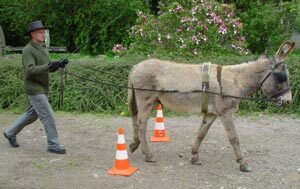 On the whole, the donkey consent's to pull a cart but it's better for the donkey to have received a training course to practice this discipline. 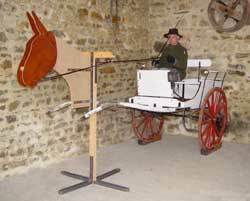 That's why the "Asinerie du bocage" suggest to you day's introduction to the carting to minimize mistakes and to give you confidence with your donkey. With the model, you will learn how to handle the guides with dexterity to be very soft with the mouth of the donkey. 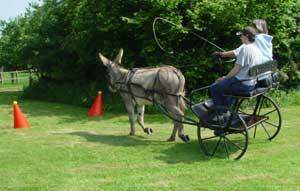 To work with long-reining allows you to drive the donkey and teach him to respond to your instructions. To be safe, you must never drive without an assistant. - 2nd session: training in long-reining, 2 and 4 wheels cart's. For this type of instruction an annual licence from the 'Fédération Française de l'Equitation" is required (price 36 € per person). Here is an example of the required licence completed, as well as the coverage included in the insurance of the licence. Carting is a discipline extremely enjoyed by the family, but requires the donkey to have a good education to obtain the maximum satisfaction, and to avoid taking unnecessary risks. We thus propose to you, boarding the donkey with us to be able to educate it in carting (single or double carting). The minimum age to educate your donkey in carting is 18 months, and it can be more difficult after 4 years. I have stallions in the asinery, so for reasons of safety, I can accept only females or donkeys gelded for the moment. After introduction to carting, you can have carting course with horses (because there's no exam with the donkeys) with a teacher of the French Carting School to take the exams. With these exams you will be able to participate in competition with horses or donkeys. To find out more about classes in carting, please contact us.